Start off the morning with a refreshing 20-minute walking tour around the Grandstand apron, Pimlico Museum, barn area, and more! Interact with the people and horses during their daily routine of workouts. Take advantage of this free tour while it lasts because it ends Friday! The Black-Eyed Susan Day has been a tradition at Pimlico since 1918 when the race was first ran. This race is a mile and one-eight in length and is traditionally ran the Friday before the Preakness by three-year-old fillies and “has long been recognized as the middle jewel of the traditional filly Triple Crown, which also includes the Kentucky Oaks Stakes and the Acorn.” For more events happening Black-Eyed Susan Day, follow this link. 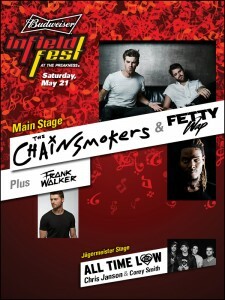 For those of us from Baltimore, InfieldFest is a huge deal! This enormous party will feature live performances by The Chainsmokers and Fetty Wap, Frank Walker, All Time Low, Corey Smith, and Chris Janson. Prepare yourself because this will be an all day celebration starting at 8:00 a.m. and ending at 7:08 p.m.
It’s time for the 141st Running for the Preakness Stakes where the best derby horses test their abilities to win the Triple Crown! This race happens on the third Saturday of every May and is a historic event in Baltimore! The fun of Preakness weekend is just beginning and we couldn’t be more excited!